As part of the campaign, Morton is making a $20,000 donation to the ASPCA to help continue its life-saving work and provide resources to pet owners on pet wellness. In addition, for every unique Facebook fan “like” received on Morton’s Facebook page from Oct. 1 through Jan. 31, 2012, Morton will donate $1 to the ASPCA, up to $55,000. This additional funding from Morton will be used by the ASPCA to raise awareness about the importance of proper winter pet care and safety. “Pet owners should know the importance of keeping their furry friends safe during the winter, which is what we hope to raise awareness about by teaming up with Morton for this public service campaign,” said Elysia Howard, vice president of marketing and licensing for the ASPCA. 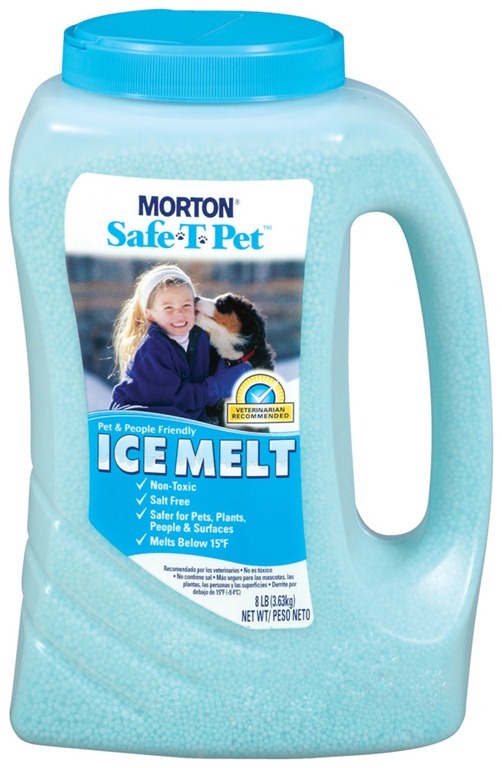 Using pet-friendly (salt free and chloride free) ice melters such as Morton® Safe-T-Pet®. Keeping anti-freeze high on shelves in sealed containers and quickly cleaning any spills/leakage. Limiting outdoor time for pets when temperatures drop below freezing. Checking warm spots on cars, such as hoods, where animals might seek shelter from the cold. Making sure pets are wearing identification tags and proper outerwear as needed. 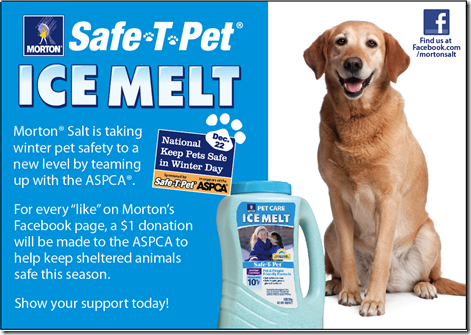 More tips and information can be found on the Morton Salt Website and Follow Morton Salt on Facebook or check out the ASPCA on the Web or on Facebook or Twitter. The amazing people at Morton Salt decided to put together a prize pack for one lucky 2Boys+1Girl=OneCrazyMom reader; we all want to make sure that our beloved four legged family members are safe this Winter Season; so be sure to enter this amazing Pet Giveaway below. What an amazing Prize pack and I’m super excited to be able to give this away to one lucky reader. Being a mommy of two amazing Pup’s I know all to well how hard winter can be on our Fur Babies. Growing up in Germany I remember very well how my Yorki suffered through the snow and cold weather and his paws sure hurt with all the salt that wasn’t pet safe. 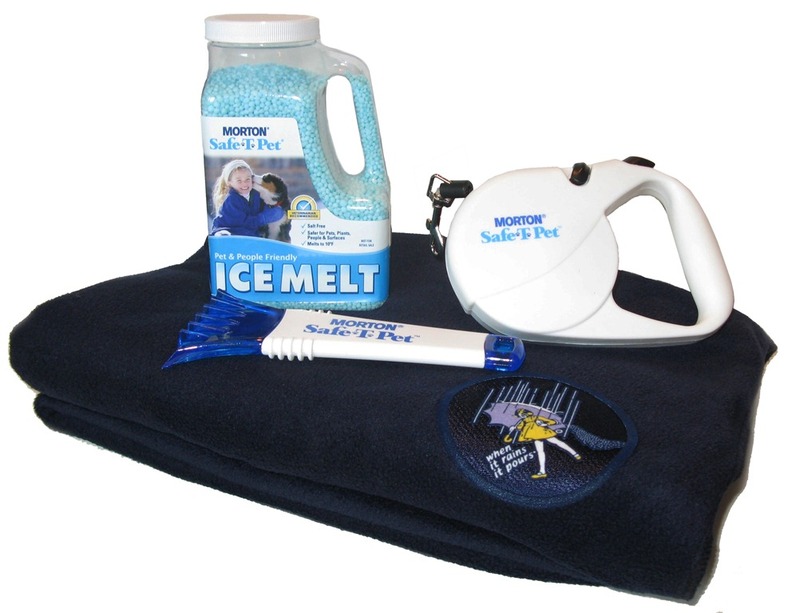 I’m so excited that there finally is an alternative to keep our pets safe and pain free… Winter can be very dangerous on our beloved pets, so keep them safe this year an every year, so they can enjoy the Winter Season for a long time to come….. I received the same prize pack as my winner for posting. All information was provided to me by Morton Salt or their PR company; the prize pack will be mailed directly through the PR company to the winner; Facebook is not associated with this giveaway and is hereby released from any and all Liability. Limit you dogs exposure to the cold elements. Don’t leave your dog outside or in the car for too long. I make sure that I have a coat on them when it gets cold! We try to make sure our animals have nice cozy beds. We bring them inside at night, and make sure they always have water. Make sure they have plenty of fresh water and hay in kennel. We make sure to clean our dogs paws after they have been outside so any salt does not irritate their paw pads. Clean their paws and take them inside at night. It’s smart to know when it’s just too cold to have a pet out for too long. I try to avoid walking them at night during the cold months. We have installed a doggie door from the outside into our laundry room so that our dogs can come in to get out of the cold and stay warm. Don’t leave your pet outside for too long!! I keep my pets indoors, during the winter months. When they must go outside to use the bathroom I try to make it quick. Don’t keep them out in the cold as they need to be as warm as we do. We like to leave a blanket or 2 on the floors in the winter they like to snuggle down in them after being outside. I keep my dogs safe by putting a coat on them when it gets below freezing and then drying their paws off to get snow clumps out of the fur there when they come back in. Even in winter I don’t leave them in the car for very long. Check their water at least a couple of times a day to make sure that it is not completely frozen. Always clean their paws off after flolicking in the snow. Snow chunks in their paws really hurt! Make sure not to leave your pet outside in the winter…it can be very dangerous not to mention cruel! Regularly check your pet’s water to make sure it’s not frozen.